For some reason I’ve been getting a lot of questions about the best pump action shotgun. Well, here’s the deal… There is no best pump action shotgun. There’s no ideal pump action shotgun. It doesn’t exist. There is no such thing. Even my beloved 870 is not the ideal shotgun. It’s not perfect. And that’s it. Those 3. In that order. And really, the Benelli if you want the option for 3.5″ shells. Which is nice, but unnecessary. But I do like the stocks and the sights. But not much else. My ideal pump action shotgun, which doesn’t exist, would be a hybrid of the 870 and the 500/590. I like the Steel Receiver and the Bolt of the 870. But I like the Shell Lifter and Safety on the 500. 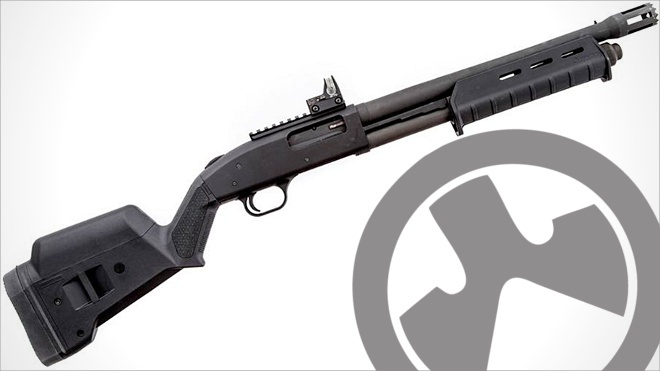 If I could have an 870 fitted with a Mossberg Safety and a Mossberg Shell Lifter – and use the Magpul shotgun stock – That would be just about damn near as ideal as it could get. Let’s add good Rifle Sights to it, and interchangeable choke tubes. That would do it, pretty much. The Magpul stock on a Mossberg is probably the ideal set up. Or at least the most ideal set up I’ve handled. It’s very ergonomic and feels great… keeping the felt recoil under control and keeping the safety right there where you need it. No love for the Ithaca 37? I was thinking about this the other day and I agree there isn’t a perfect pump. I would go a little bit different route on the hybrid though. I love how with Winchesters you can be pulling back on the pump when you press the trigger and the action will go flying back as soon as the shot breaks. That makes it the fastest and smoothest action. If you try that with a Mossberg or a Remington it will actually lock up. But I really like the lifter and the controls on the Mossberg, the safety and the action release are more convenient that the 870 and the Winchester. So a Mossberg that could run as fast and smooth as a Winchester would be my ideal hybrid. 1100’s tend to be a little longer, but otherwise fine. Not wanting to mess up a pump shotgun thread, but I agree that 1100s are fine. Slap a Speedfeed stock on it, put a small reflex dot up top or, as you say a “deer’ IC barrel with rifle sights and its a pretty good tactical shotgun. But, I completely agree with the thread premise, that given the choices for a pump, I would put an old, well broken in 870 Wingmaster out front. They are slick, smooth and almost indestructible. Parts availability and aftermarket tactical stuff is deep and wide. Picked up a Magpul edition 590A1 as a Christmas gift to myself and I can’t leave this thing alone, just love it. The fit, feel and finishing touches with rifle sights and 8 shot mag tube was just what I was looking for. Built like a brick shithouse, needs nothing. And the bayonet I wasn’t expecting…BONUS. (yes, at times I’m easily entertained with trivial things) Had a shorty 500 with a pistol grip, it was…meh, it served it desired function I suppose. And so here sits a naked and neglected 870 magnum express. Hmmm….ideas? I have a remington 870, order number 81180, a 20 gauge tactical with a knoxx spec ops stock. I like it because the wife and daughter can handle it with ease, even with 3″ shells. They learned to shy away from the other 870’s since they kick like a mule they say. George, you previously knocked the 870 and 500 in great detail (check your archives), and called the Nova #1. Wile it’s entertaining watching you contradict yourself, you lose credibility. Make up your mind! People can change their minds based on new experiences. Especially when archives span so many years… I’ve been an avid 870 fan for many years now, and a 590 fan before that. Own an 870, but read somewhere that the best HD is a wing master with barrel cut to 18″? Better internals than the 870. Comments? Wingmaster and the police guns especially older ones pre cerberus circa 2006, are nicer than new units, much nicer than express line. Mostly they are the same, only a few parts are different, but if you are starting fresh, and have the cash, get an old police or old wingmaster. fastest, lightest, easiest shooting and most accurate shotguns I have ever found, bar none. The lack of a disconnector is fun at seriously close range (the amount of practicality would depend on how well trained one is) and the inability to load the chamber with a single round is a myth. I will never be without one. I was shooting my Win M12 “Heavy Duck Gun” yesterday with very stout turkey loads. It was made in ’57. I forgot how incredibly smooth the action is. I also remembered how it has no disconnector and had some fun holding the trigger down and letting it fire every time I pushed the slide forward. Downside, unfortunately is that the action is way, way too heavy to make a good defense gun, even if you bobbed the barrel back a good bit. JMB got that ‘sum bit@h right, if only it were lighter. Definitely looks like something the S.W.A.T. would use.